My movie minutes: Rajinikanth Rejuvenated. Rajinikanth is a special kind of hero because he inspires his fans more than any other actor.It is his electrifying energy levels in voice vibration and bodily movements that have remained as a treat to his most ardent fans whose last Rajini feast was Shankar's Sivaji. Following this most memorable film,Shankar and Pa.Renjith took Rajini on a totally different track of screen journey thereby making most film goers long for a Rajini film in the line of Baasha,Muthu,Padayappa Chandramukhi and Sivaji.The young director Karthik Subburaj deserves a special pat for presenting Rajini in his Petta,with a totally refreshing make up that takes the superstar to his forties.The first half of the film reverberates with invigorating events comprising Rajini's invincible style,sense of humour and tempestuous action sequences.The most fascinating Rajini formula is born again and it looks as though Rajini himself breezily enjoyed his role play from the start till the end. 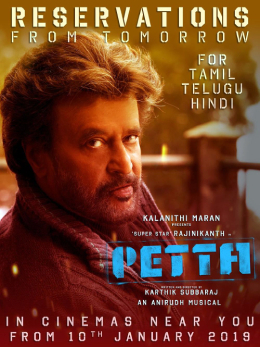 In a star studded film,Rajini overtakes all the others by his singular determination to get vigorously closer to his starved fans.The huge cluster of stars includes Rajini's one time famous director Mahendran and the new generation popular actors like Vijay Sethupathi,Bobby Simha,Sasikumar, as well as the two women Trisha and Simran who had no chance to act with him so far. Besides there is the Bollywood fame Nawazuddin Siddiqui as Villain.Anirudh's music takes the film to its height of enjoyment with mood upbeat songs. Tirru's cinematography and Vivek Harshan's editing are significantly responsible for the impressive show,the film makes.Yet another unusual beauty of the film is the in-between ringing of old tunes from films like Paava Mannippu,Sumaithangi,Paasamalar and Mullum Malarum,transmitting the glory of the immortal Tamil film songs of the Nineteen Sixties and Seventies for a nostalgic reverie.It is a reflection of the director's aesthetic quest to blend the old with the young. Though the events after the interval move on predicted lines the most celebrated climax of the film throws a couple of surprises that put Vijay Sethupathi in an unenviable predicament.The contrived scheme of actions carried on by the hero with epic references seem to raise an undercurrent of qualms and ethical questions,against the rightness of destroying the enemy through the back door. Vijay Sethupathi certainly stands victimized by the entangling manipulations of the hero.The concluding haughty laugh of the hero would draw more sympathy to Vijay Sethupathi sitting in absolute shock at the turn of events. What makes Petta an engaging movie is the travel of the Superstar with his unfailing trade mark genre of energy demonstration despite factors of ageing. Rajini has once again vindicated Shakespeare's maxim that 'age can not wither' him.The film will get into the nerves and emotions of his fans to stay firmly in their memory until a similar Rajini film is released.After all,they want to see their hero ever young and do the impossible in his inimitable style. Two thriller narrations on the Tamil big screen.